Tickets for "The Brian Bosman Show" are available for purchase in our Aerie from the bartender. You may also purchase your tickets right here using PayPal. You may choose to purchase 1-10 tickets using the drop-down menu and the PayPal button below. The use of this service incurs a small service fee that covers the amount we pay PayPal. (You do not need a Paypal account to purchase them here.) Please make sure you include your phone number on the payment information. We will hold your purchased tickets at the door for you on the night of the event. You may also choose to pick them up at the Aerie in advance if you'd like, just let us know if you prefer to do that. Brian Bosman Tickets - Click drop down arrow to choose quantity. Join us for a fun evening! 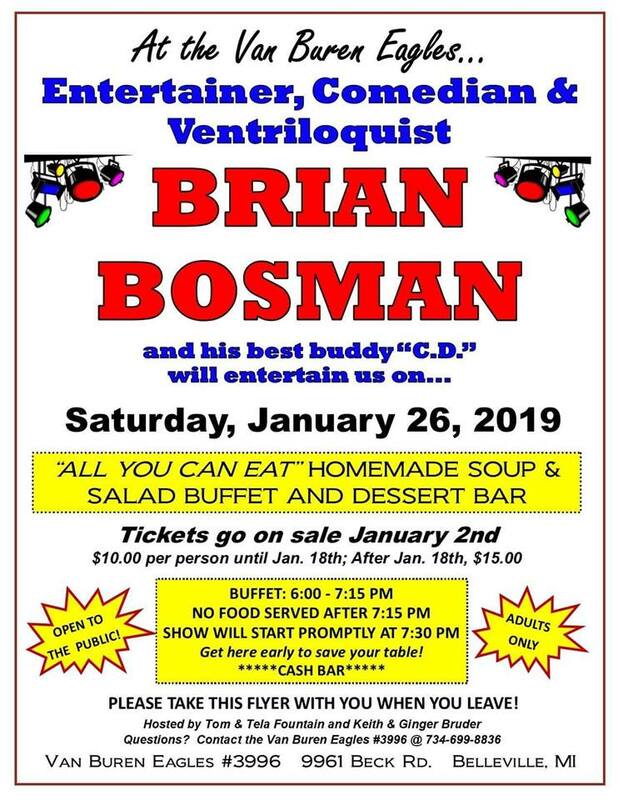 Entertainer, comedian and ventriloquist Brian Bosman and his best buddy "C.D" will entertain us. Bring your friends, this is a show you will not want to miss! OPEN TO THE PUBLIC! The evening will start with an "All You Can Eat" Homemade Soup & Salad Buffet and Dessert Bar and end with this awesome show. Get here early to save your table! Brian is a multi-talented artist—a comedian, does Elvis and some blues. He will bring along his buddy, C.D. for his ventriloquist routine. For an evening of $10, you can’t beat it. We’ll have at least eight kinds of soup, including vegetarian and gluten free. Our crew is known for our soups including German Spaetzle (noodle), Gumbo, Beef Barley, Italian Wedding Soup, Dill Pickle Soup and much more. There will be plenty of assorted salads, too. You will be able to purchase these soups to take home at a nominal cost that evening. It’s a good time to bring a potential member.